There are many ways to pass family history down from generation to generation. For some, it is the old Family Bible. For others, it could be an oral history from a grandmother to her grandchild, or boxes of mementos and old photographs tucked away in an attic. Well, I just read a fascinating article in my monthly DAR magazine about “The Graveyard Quilt”. No, this isn’t a festive Halloween quilt to bring out each October. In 1836, a woman named Elizabeth Roseberry Mitchell began stitching a quilt in memory of her two-year old son, John, who had just died. In 1843, she added another son who had died at the age of 19. What’s so unusual about her quilt is that it features a graveyard in the center; on the top is where the graveyard is located in Monroe County, Ohio. At first, the macabre, almost Tim Burton look to it, made me sad. I had never seen such a depressing looking quilt. I wanted to learn why this woman chose such a depressing way to remember her family. Apparently, when the family moved to Ohio, she wanted to make sure that no one forgot where these boys were buried. So, from a mourning perspective, Elizabeth used a talent she possessed to not only remember her deceased children but document family history for future descendants. It became more than just a quilt, but a genealogical and historical artifact. I appreciate the love and sentimentality Elizabeth crafted into her quilt, although I must amit the method of keeping up the quilt bothers me. You see, when a child was born into the family (a joyous occasion usually filled with happiness and hope for their future), a black, eight-sided coffin was immediately added to this quilt around the outer edge. When death occurred, these coffins would be removed from that edge and reapplied into the graveyard area, located in the center. The death date would also be embroidered. I can see the practicality in having a set procedure for the family quit, but it is rather gruesome…at least to me. On the subject of quilts, I LOVE quilts, and even took a quilting class years ago. I love the design, various materials and colors incorporated, as well as the definite talent and patience quilters have. Unfortunately, I lack patience. When I start something, I want to zip through it or I get bored. So, not a quilter do I make! However, my grandmother and great-grandmother made quilts all the time. I recently found a letter from my great-grandmother to my grandmother written in pencil during the Great Depression where she mentioned how hard it was to come by cotton and material for her quilting projects. So, she was going to make a wool quilt for one of her sons. I also have some quilt tops that were projects my grandmother worked on with her mother and her sisters. I remember my mother pointing out to me material that had once been used in childhood outfits of hers or how ‘that fabric came from the kitchen window curtains”. She could even identify what stitching belonged to her grandmother, her mother and each aunt. Like the brush stroke of a great artist, she knew each person’s style. The thing is, I knew by the way my mom talked about these quilts that this was more than a blanket, or bits of old fabric fashioned into a design. A family activity between a mother and her grown daughters had become part of that family’s history…and the beginning of my interest in preserving family history. For over twenty years now, I have been researching family history, thrilled when I come upon an old photo, a piece of documentation about an ancestor, or a hand-written letter from my great-grandmother that gives so much insight into ‘who’ she was as a person. For anyone doing genealogical research, you run into so many road blocks that it can be discouraging. It saddens me to think of the artifacts and records destroyed over time, sometimes deliberately. Let’s just say, don’t bring up the name General Sherman in my presence! So, searching for any article of family history becomes a personal quest. Finding what I like to call a “puzzle piece” is more than just a reward for the hard work that often took years to find. That piece becomes almost sacred because it helps to complete the family picture, and even moreso when it is something that was held or crafted by an ancestor. Apart from the artwork and design of quilts, there is often a family legacy in the finished project. For me, it is the visual I still get of my grandmother, her sisters, and my great-grandmother all sitting around together and sewing a quilt while their children play outdoors. I picture them laughing and talking about life and their families. It is MY connection to that moment in time and I feel even more a part of them. So, when I read about The Graveyard Quilt, although my initial reaction was the sadness involved by picturing this woman sitting down and adding cloth coffins, I also admire her passion to preserve the history of her family. Granted, the procedure she followed would have been too emotional and fatalistic for me. There is no way that when a child was born in my family, I would have felt right about making a cloth coffin for them to put on the family quilt. BUT, for Elizabeth Roseberry Mitchell, her initial process of mourning became a passionate desire to maintain family history and remembrance of all who passed on in her family…and it was done perhaps the only way she knew how — through quilting. The end result, family history was preserved. 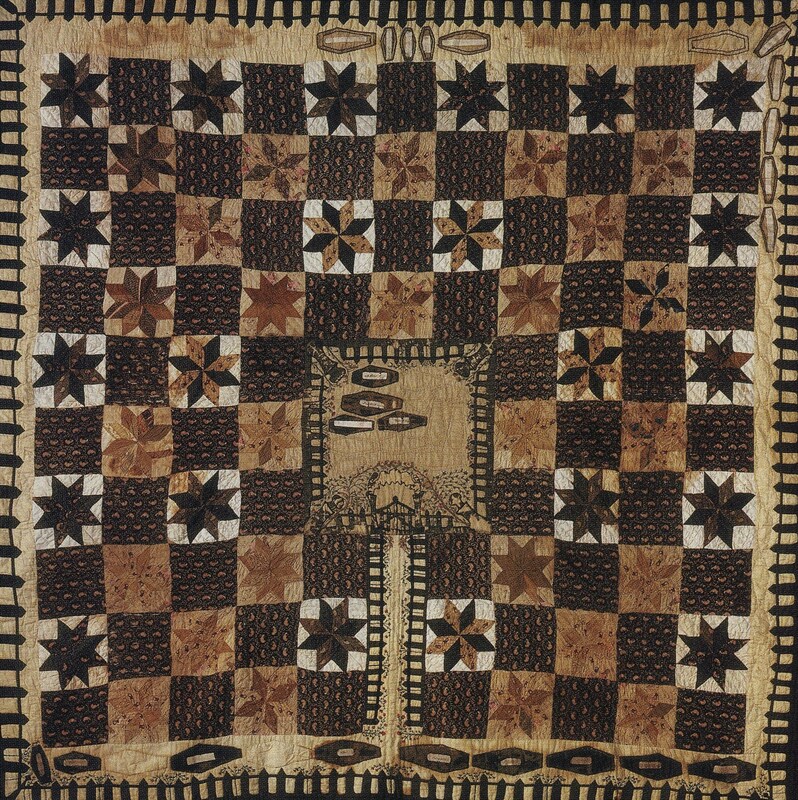 After 174 years, though quilters today may be impressed by Elizabeth’s “traditional layout of a center medallion surrounded by blocks of alternating 8-pointed stars and black printed fabric”, for anyone who has spent hours and years searching for one clue about their ancestors, “The Graveyard Quilt” (macabre as it may seem) is a tangible artifact and sacred history for any descendants of Elizabeth Roseberry Mitchell — as well as an example of an unusual and innovative way to document a family tree. “Still round the corner there may wait, A new road or a secret gate, And though I oft have passed them by, A day will come at last when I, Shall take the hidden paths that run, West of the Moon, East of the Sun.” ~ J.R.R. On this day (Sep 2) 1973, J.R.R. TOLKIEN, the man considered by literary circles to be the ‘Father of Modern or High Fantasy Literature’, died at the age of 81. Born in South Africa on 03 Jan 1892, John Ronald Reuel Tolkien was raised in England and graduated from Exeter College at Oxford in 1915. After serving as a Second Lieutenant in the Lancashire Fusiliers during World War I, his first job as a civilian was working on the history and etymology of words of Germanic origin for the Oxford English Dictionary. In 1920, he became the youngest professor at the University of Leeds, where he produced a Middle English Vocabulary. In addition, while working with E. V. Gordon, he created a definitive translation of Sir Gawain and the Green Knight (which became an academic standard for many years). In 1925, Tolkien returned to Oxford as Rawlinson and Bosworth Professor of Anglo-Saxon, a position he held from 1925-1945. During this time, while grading exams, a distracted Tolkien wrote something across the top of a paper. The single line, “In a hole in the ground there lived a hobbit” not only inspired but would eventually become “The Hobbit”, a novel published in 1937. In 1945, Tolkien was appointed Merton Professor of English Language and Literature at Oxford University. Between 1954 and 1955, he wrote a sequel to The Hobbit entitled, The Lord of the Rings. Also set in the fictional Middle Earth, the trilogy followed the adventures of a noble hobbit named Frodo Baggins who, joined by companions, a wizard, and various races living in Middle Earth, embarked on a quest to destroy a powerful and evil ring which could destroy everyone and everything. 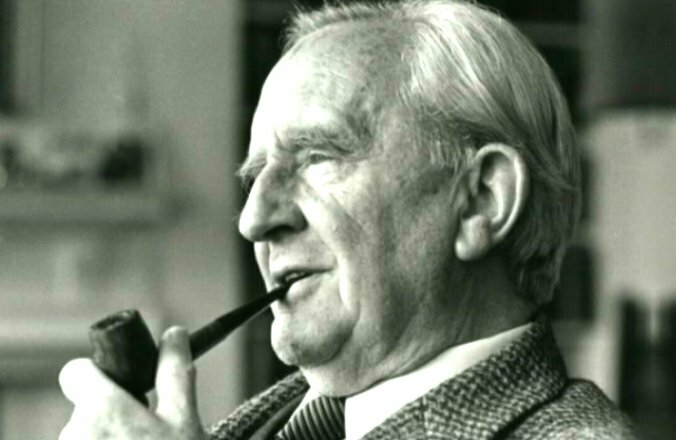 “The Lord of the Rings,” Tolkien admitted, began as an exercise in “linguistic esthetics” as well as an illustration of his theory on fairy tales. Then the story itself captured him. The Lord of the Rings became a best-selling classic and has been adapted for radio, television and film, as well as video games and music. In December 2001, director Peter Jackson brought the trilogy to the big screen, subsequently earning a total of 30 Oscar nominations for all three films, and winning 17 Academy Awards including the Best Picture award for the final installment, Return of the King. Married to Edith May Bratt on 22 Mar 1916, Tolkien and his wife would have four children. A devoted husband and father, he was also a close friend to C.S. Lewis, whom he first met at Oxford. In May 1927, Tolkien enrolled Lewis in a club called ‘Coalbiters’, which read Icelandic sagas in the original Old Norse. In his later years, the increasing fame from his work made the quiet, academic Tolkien uncomfortable. Repeatedly approached and contacted, he was forced to remove his name from the public directory and moved with his wife to Bournemouth. A devout Roman Catholic with Conservative political views, he disliked his work being referred to as a cult phenomenon or any inference that he was a ‘cult figure’ himself. On 01 Jan 1972, Tolkien was appointed a Commander of the Order of the British Empire in the New Year’s Honour’s List by Queen Elizabeth II. On 28 Mar 1972, he received the insignia of the Order at Buckingham Palace. For me, he was an endearing storyteller whose likeness and personality I always see in one of his characters. A kind and gentle wizard known by different names to different people. Stormcrow. Mithrandir. Gandalf. Or, Tolkien. They are one and the same to me…and perhaps other fans as well.